Here's my entry into the fray. Yes! This is the showdown I've been waiting for. Great idea! Oh the justice. I can see it now: A DARTH BORG - the two are one. Can you see it now? 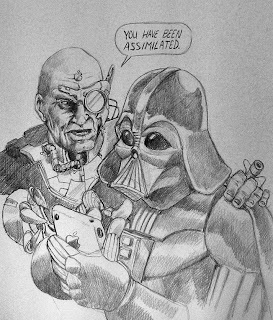 Darth and Borg together? I can hear their conversation now. Arm raises. The force begins to strangle the Borg side. Strangling pauses. He strains to hear the voice clearly. Is it his old Jedi Master Obi Wan? - A DARTH BORG JAR-JAR - three are now one. Uh Ani? Robot guy? Meesa hungry. Silence. Breathing. Both Borge and Darth's hands raise to strangle themselves, trying in vain to silence the annoyingly cheery voice. But wait! They can't strangle Jar-Jar cuz he's now a part of them. Ahh - sweet justice. The circle of life is complete. If only I could draw . . .
Was I channeling my inner Jar-jar by using the annoyingly overused word “now” in the above intro? Sure - you bet. How insightful of you! Pssst . . . a word of advice - don’t try to be quick and choose the name and URL option when posting. Sadly it will not let you edit your comment. As a writer this is maddening . . . sigh.